The 1950's were a tumultuous time for soccer in the United States. The only professional league was the American Soccer League and it had a turnover of teams that one would expect from soccer between its two heights of popularity in the thirties and seventies. Confined to the Northeastern hotbeds of New England, New York, New Jersey, and Philadelphia, the league drew crowds of one to three thousand and few paid much attention to it. In 1959, a team called Colombo, based out of Staten Island, NY, joined the ASL. For the three seasons before, New York Hakoah won the ASL championship. For the four seasons after, the Ukrainian Nationals of Philadelphia won the ASL Championship. Between these periods of single team dominance and led by veteran player-coach Jack Hynes, Colombo would win the league in 1959-60, their only season of play, go on tour of Italy and subsequently disappear. Jack Hynes played in the ASL for 23 seasons. Born in Scotland, his family moved to the United States when he was 13. He began playing professionally for Brooklyn St. Mary's Celtic in 1935 at the age of 15. In the 1938 National Challenge Cup (now the U.S. Open Cup) final, Brooklyn St. Mary's Celtic by Chicago Sparta 3-0 in Chicago with Hynes coming on late for Brooklyn when he was only 17. He joined the US Army during World War II and was injured in the Battle of the Bulge in 1944. That injury left him with shrapnel in both legs and no feeling in his left calf. After leaving the military in 1946, he returned to playing soccer again. In 1949, Jack was the key piece for the attack of the New York Americans. He led the team in goals and helped them advance to the ASL championship where they lost to the Philadelphia Nationals. Jack was also a pivotal part of the United States World Cup qualifications in 1949. The team was in group nine with Mexico and Cuba. Jack played the full ninety minutes in each of the four matches helping to advance to the 1950 World Cup, but was left off of the World Cup squad when he criticized the team selection for the qualification matches. He continued to play in the ASL after his National Team fall out. In 1956 he received the ASL MVP award at the age of 36 while playing with Brooklyn Hakoah. In the fall of 1959, he joined Colombo as a player-coach. Colombo was a dominant team. In a league that contained US National Team greats like Benny McLaughlin, they finished the season after 18 games with 15 wins and a +45 goal difference. Their team contained Americans and international players from Europe and South America. Anthony Bonezzi was an Argentine midfielder that played for both the United States and Israel's national teams in 1961. Carlos Bustamente was a US striker that teamed with Bonezzi on Colombo, Brooklyn Italians, and Israeli teams. 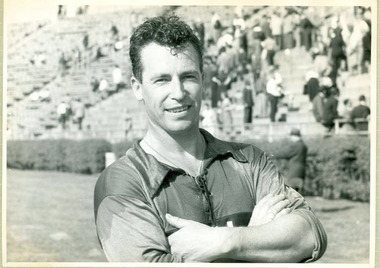 In 1959, just prior to joining Colombo, he was a part of the Montreal Canadian Alouettes FC which won Canada's title, the Carling's Red Cap Trophy. These players would go on to finish second and third in goals, with teammate Mario Zelaschi placing fourth. All three combined for 35 goals that season when the league average was 34.7 goals. Of the ten teams, those three players out scored eight of them. During this time, the ASL gave two points for a win and one for a tie. Colombo finished in first with 31 points and Ukrainian Nationals finished with 26 in under 20 matches. After the season ended, the team took a playing tour of Italy. Not much can be found about the tour. Information on why the team was disbanded is hard to find. Jack Hynes retired at he end of the 1959-60 season and became a successful coach as he led Monsignor Farrell Lions to not lose a single match during the seasons from 1987-1994. Bonezzi and Bustamente went to play for Beitar Tel Aviv in Israel. They were banned after playing their first match due to Israel’s no foreign players rule but were later reinstated. In 1967, they were both in an accident which left Bustamante permanently injured and killed Bonezzi. Mr. DiFilippo continued his tailoring business in New York for the next 45 years.